The best type of FRP grating for swimming pools and waterparks is T-1800 Pultruded Grating. This profile provides lots of surface area to make walking on in bare-feet very comfortable. We use a mild grit on our pool grating that provides enough traction to prevent slipping, without being too coarse. We add a UV coating to our Fiberglass Pool Grating to protect the color from fading due to the chlorine or sunlight. Most of the molded FRP Grating we sell goes into industrial settings such as waste-water treatment plants. Guys with work-boots need strong, anti-corrosive grating with a coarse grit to provide traction. For swimming pools and waterparks, large open mesh types of grating are far too coarse to walk on with bare feet. The 1.5″ square mesh pattern creates a 1-1/4″ square open area which is not comfortable to walk on without work-boots. This Swimming Pool Grating with Yellow Nosing is much easier on the feet and has a high visibility yellow band. 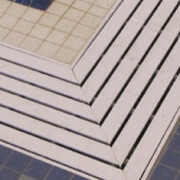 T-1800 Pool Grating comes in 1″ or 1.5″ thick. T-1800 Grating comes in Light Gray or white. The nosing which runs along the leading edge of each stair can be white, Gray, or yellow. T-1800 can be fastened to the underlying supports using stainless steel insert clips that slide in between the bearing bars. Once installed, there is no contact with the top surface of the deck or stair-tread. This keeps the decking surface absolutely smooth, so there is no chance of stubbing your bare toe. A smart, simple solution. Lightweight T-1800 is also an excellent choice for children’s play structures. Standard Pultruded Grating panel sizes are 3′, 4′, or 5′ wide in lengths of 8′, 10′, 12′, or 20′. Call National Grating at 1-877-984-7788 to request a quote. National Grating provides swimming pool grating to ALL USA States including California, Oregon, Florida, New York, Illinois, Pennsylvania, Ohio, Georgia, Michigan, Virginia, Massachusetts, Arizona, Washington, North Carolina, Nevada, Texas, New Mexico, Indiana, Tennessee, Colorado, Maryland, Missouri, Wisconsin and Utah. Our pricing and service experts are standing by to help to find the best product for your project. With many varieties in stock and expedited shipping, we can supply your project with swimming pool grating at the best price. In today’s connected world, we depend on cellular telephone signals, Wi-Fi networks and over the air radio and television signals. Wi-Fi and Bluetooth connectivity are essential to on-site work environments. Steel structures significantly disrupt these signals. Fiberglass swimming pool grating is an essential part of FRP building structures that are “electronically transparent” and do not interfere with radio frequency transmissions.